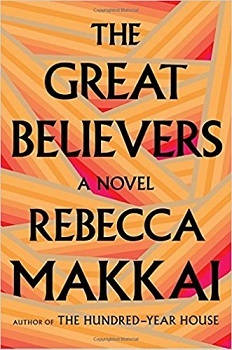 Rebecca Makkai’s The Great Believers is a spot-on portrayal of the devastation and heartbreak of the AIDS crisis and the lasting legacy of those who survived it. In it, Makkai deftly weaves together two stories told in alternating chapters; one focusing on a group of friends in Chicago’s Boystown in the 1980s, and the other set in contemporary Paris. At the center of the story are Yale Tishman, a development director for an art gallery in Chicago, and his partner, Charlie. Yale is more reticent than Charlie, who seems always to be in the spotlight at any party. In private, however, Charlie is suspicious about Yale’s activities and insecure about Yale leaving him. Beautiful, beloved Nico is the first of Yale and Charlie’s friend group to become ill. Nico’s decline and death are gut-wrenchingly sudden, and occur just at the time when fear and misinformation about this mysterious disease are beginning to swirl through the Boystown community. If you lived through this time, you will well remember the paranoia and confusion that surrounded this illness. Tragically, Nico’s parents excommunicated him when he became ill, but his younger sister, Fiona, stays by his side. Although only 18, Fiona dedicates herself to supporting other young men in Nico’s circle through their terrible suffering, taking on a burden of grief that makes her forever guarded about intimate relationships; she ultimately finds marriage and motherhood a difficult challenge as a result. The second interwoven story places Fiona in Paris 30 years later, trying to track down her daughter, Claire, who she now suspects has a daughter of her own. They haven’t spoken for years since Claire became involved in a cult. While in Paris, Fiona stays with Richard, a photographer who documented AIDS in Boystown back in the ‘80s and knew Yale and her brother Nico. Richard, the search for her daughter, and several other events vividly invoke the past and Fiona is pressed to reconcile the ways in which she is scarred by it. Because so little is documented about the AIDS crisis in Chicago, Makkai depended on original research. After putting out calls on social media to find survivors, she was able to meet and interview two doctors who founded a Chicago-based AIDS unit that became the model for AIDS treatment, staff who worked at the unit and AIDS activists. These real voices inform Makkai’s characters and add a vibrant urgency to the story. The Great Believers is a completely absorbing, heartbreaking epic with finely described characters you will miss after the last page is turned. It is a story about families of choice, political action (and inaction), grief, friendship, love and art. It honors the love and bravery of those who lived through the beginnings of the AIDS crisis, and powerfully reminds readers that this is still a very real epidemic that needs continued attention and resources. Lisa Gresham is the Collection Services Manager for Whatcom County Library System. Her favorite reads? Books like this one where the characters live on in your imagination. Grand Opening of New Point Roberts Library – Saturday, August 11!